Wesley Fishero never could have planned that an introductory class would lead him to change his minor at the end of his junior year in college. The Indiana State University graduate also couldn't have expected that it would help lead to his first full-time job. Yet that's what happened to Fishero, who decided to minor in operations management and analysis after taking the introductory course that had been restructured and included class projects with Clabber Girl. The class changes were part of a larger program restructuring of the major that has been renamed operations and supply chain management. The program now includes numerous classes that work with companies and nonprofits in Terre Haute and Indianapolis to give students real-world experience. "In general, almost every company uses operations in some way or fashion," said Fishero, who works at Union Hospital after the organization hired him following work he did there as part of an operations course. "You wouldn't think of a hospital as a supply chain organization, but we have a huge supply chain." The major's restructure came after a review process that all academic programs undergo periodically, said Paul Schikora, chair of the marketing and operations department in the Scott College Business. During the review, ISU officials learned that the previous operations program did not meet the needs of university students or businesses. "There was some misunderstanding among our stakeholders about what the major was," Schikora said, "and we also found a desire from both the industry and students to have a curriculum that provides a broader exposure into the supply chain management area." The curriculum in the restructured major still includes many traditional topic lessons, though more case studies similar to what occurs in a company's supply chain have been incorporated. The coursework also has been updated to reflect the program's place in the department. In early 2011, the Scott College reorganized from two departments into three by pairing marketing with operations and supply chain management into the new department, as they both are vital links in a supply chain. "In every business relationship, there's somebody making goods or providing services, somebody marketing those products, and then somebody else purchasing and using those goods and services in their own operation," Schikora said. "There is a natural link between the two majors in business. We never really did a good job of bringing the majors together in the old college organization." The number of students majoring in operations and supply chain management has grown from around a half-dozen annually in recent years under the old major to more than two dozen in 2012-13 with the revised program. More students also are enrolling in the course where Fishero learned the Lean Six Sigma process, an industry-recognized method for problem-solving and continuous improvement. Fishero became green belt certified, the first level of certification, through a project with Union Hospital. Earlier this year, the hospital hired him to develop a companywide program that incorporates the Lean Six Sigma problem-solving process. "If a student comes here, spends four years doing nothing but attending classes, reading books and writing papers, they're really not as well-prepared for the job market as they should be," Schikora said. "Getting them out into these partnerships with businesses is a big deal." This semester, students in the Lean Six Sigma class taught by instructor Ken Jones are working with a half-dozen different companies, including a Kellogg's bakery facility in Seelyville and adidas in Indianapolis. "The students benefit, and the idea here is to create the opportunity and platform for students to really seize the moment and take full advantage of working with a world-class organization on a business improvement project," Jones said. "These are very impressive organizations to work with, and part of the responsibility is on the student to make the best of the situation, and I think they really have." 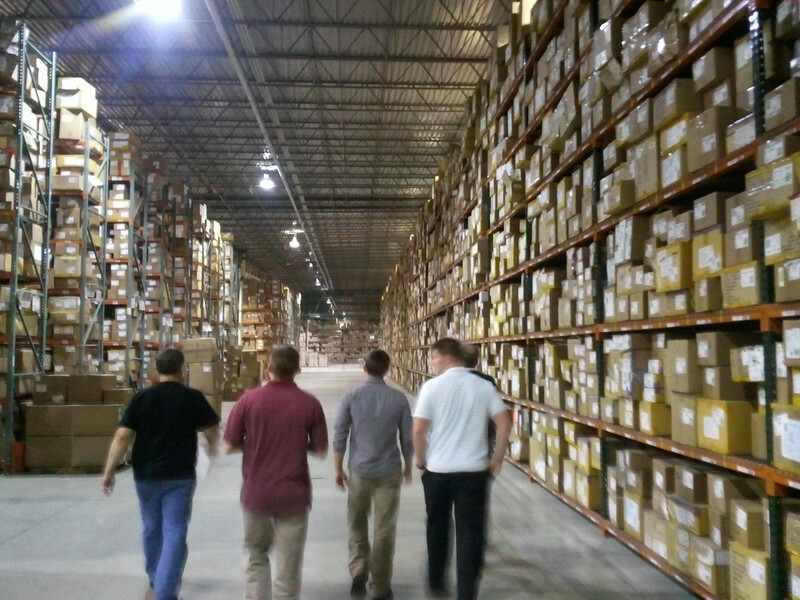 ISU students have also taken part in research with operations and supply chain management faculty members as well. Over the summer, exchange student Xiexin Liu gave a presentation at a conference in Toronto on research she did with MBA student Neil Clark and Kuntal Bhattacharyya, assistant professor of operations and supply chain management, about job-candidate fit. Clark and Bhattacharyya also presented research at a conference in San Francisco about buyer-supplier relationships from the standpoint of the supplier. In recent years, many large multinational companies have consolidated the number of suppliers they use, which has increased the importance - and power - of the supplier, Bhattacharyya said. "In the operations and supply chain management field, you teach and preach what you do. You really can't do anything other than that because then you're either doing something wrong or you're outdated," Bhattacharyya said. "Bringing the real-world examples to the classroom and building research into the classroom is something more easily done in a field like operations and supply chain management as opposed to something like social sciences, for example." By including marketing courses in the list of electives in the major, more marketing and accounting majors have been encouraged to take operations and supply chain management courses to learn about the links along a supply chain that companies use in their daily business. "It is important that future business leaders understand the full breadth of an organization's operations function so they can be fully aware of the challenges companies face in the competitive marketplace," said Brien Smith, dean of the Scott College of Business at ISU. "The combination of marketing and operations and supply chain management together in a department encourages our students to gain a more holistic understanding of business operations and develop skills that are greatly sought by employers." Students can benefit even by taking only a few operations management classes. Fishero was hired in his current position at Union Hospital because of the skills he acquired in his operations minor, which is not uncommon for students majoring in marketing or business administration, Jones said. "Employers appreciate a well-rounded business individual, but they often need that special person who really understands those critical aspects of the supply chain," Jones added. "A lot of companies live and die by their supply chain, so they're always looking for people who are knowledgeable in supply chain dynamics." Fishero has continued the tradition that started with his course. This fall, he worked with an ISU student in an operations management course on a project at Union Hospital to help the student become green belt certified in Lean Six Sigma. "If you want to guarantee yourself that an organization has something related to your field of study," Fishero said, "operations, in my opinion, is that field." Photo: http://isuphoto.smugmug.com/Other/Media-Services/Red-Cross/i-GnLLN6W/0/L/Adidas-3-L.jpg (Submitted photo)Indiana State University students tour an adidas facility in Indianapolis earlier this year. Last spring, two groups of ISU students worked with adidas employees to implement a communication process for continuous improvement. They worked on the project as part of a class in ISU's operations and supply chain management program, which recently has seen an increase in students. 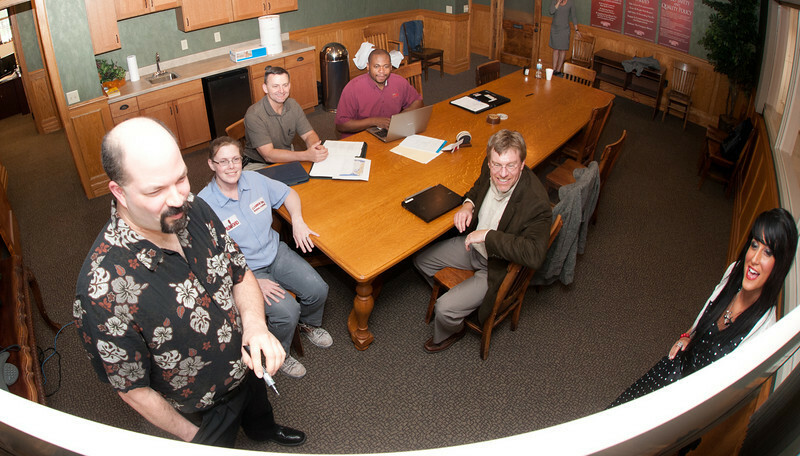 Photo: http://isuphoto.smugmug.com/photos/i-64KhPGd/0/L/i-64KhPGd-L.jpg (ISU/Tony Campbell)Indiana State University student Jason Swartzell (left), Clabber Girl employees Tonya Arthur, Ken Campbell and Kenny Bender, ISU professor Ken Jones and student Brittany Jones work during a session at Clabber Girl in spring 2011. Students from several classes taught by Jones worked with Clabber Girl officials on several initiatives that semester. Brittany Jones is also working with the company this semester. The operations and supply chain management major has been restructured from the former operations management and analysis. More students are taking coursework in the program after learning more about what it has to offer.